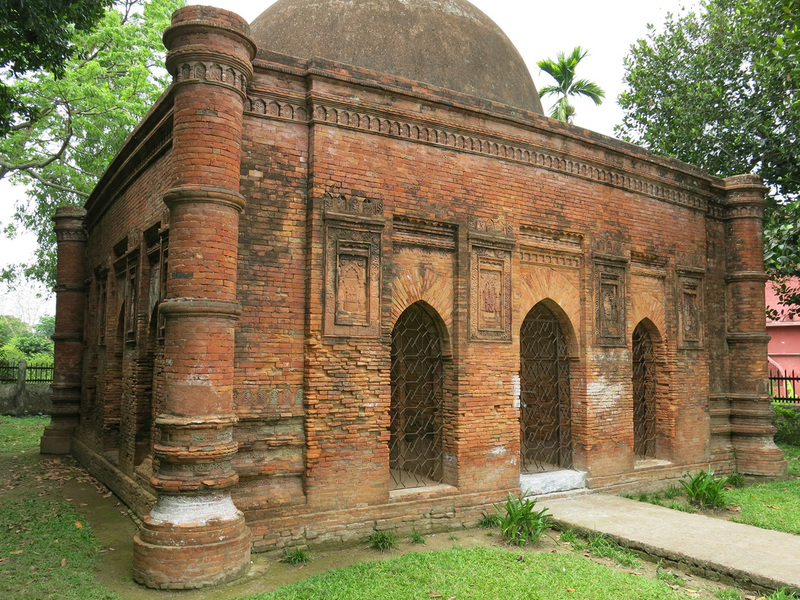 At one point in the city's history, Dhaka was known as the Venice of the East and The City of Mosques. Today's nickname The Rickshaw Capital of the World seems slightly more appropriate. 600,000 cycle rickshaws - the foot powered, not gas powered variety, weave in and out of traffic, over major highways, and through residential communities. 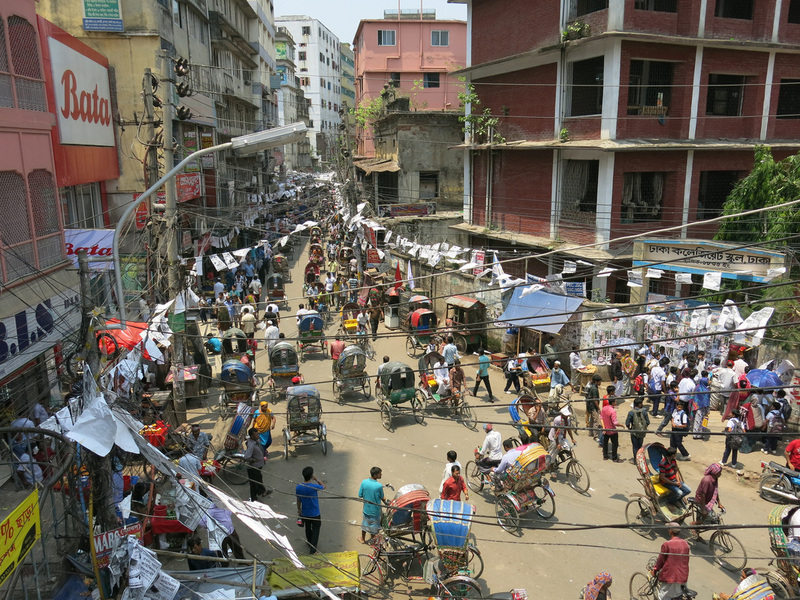 Rickshaws are the primary form of transportation for the fourteen million people calling Dhaka home. 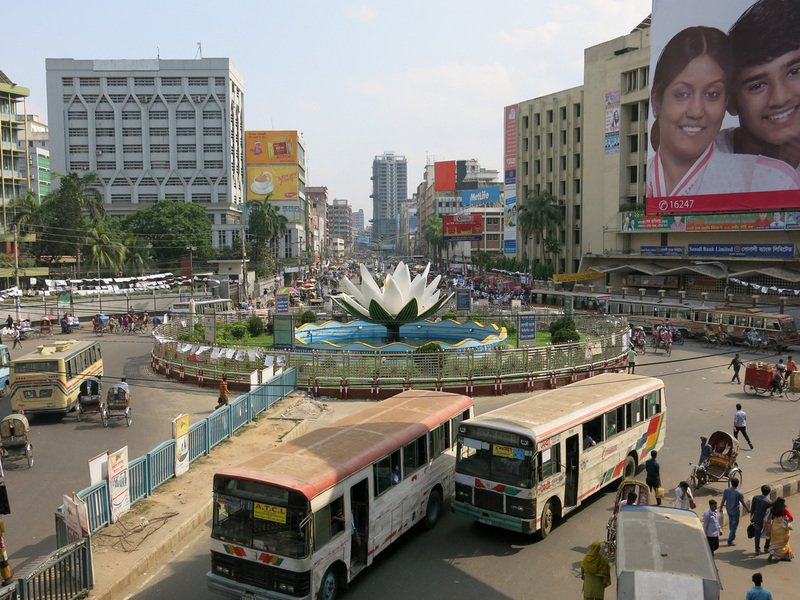 The capital city serves as the administrative, cultural, and economic hub of Bangladesh. 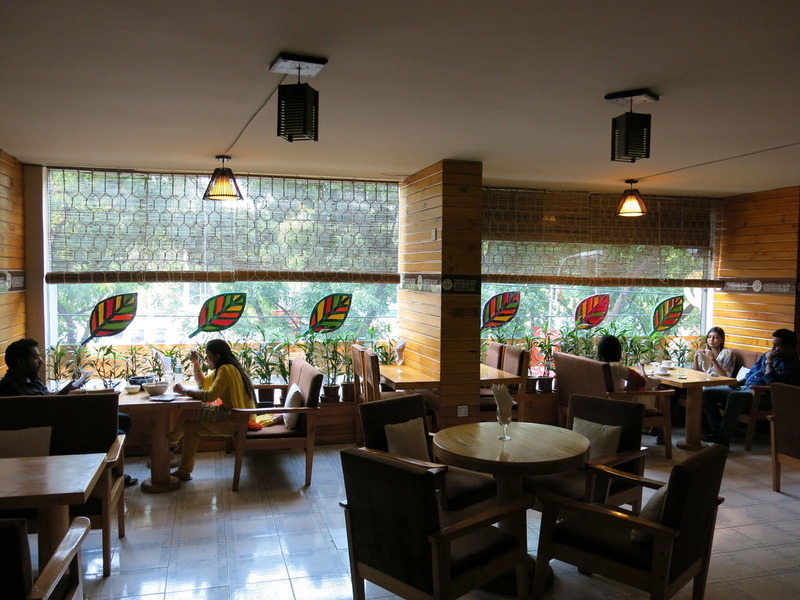 A first time visit to Dhaka provides the rare travel clean slate. No expectations. Very few concrete plans on what to see and where to go. There was only two other "foreigners" on the plane in and I saw ZERO tourists over my three day trip. The first time I saw other travelers was on the plane back to Singapore. 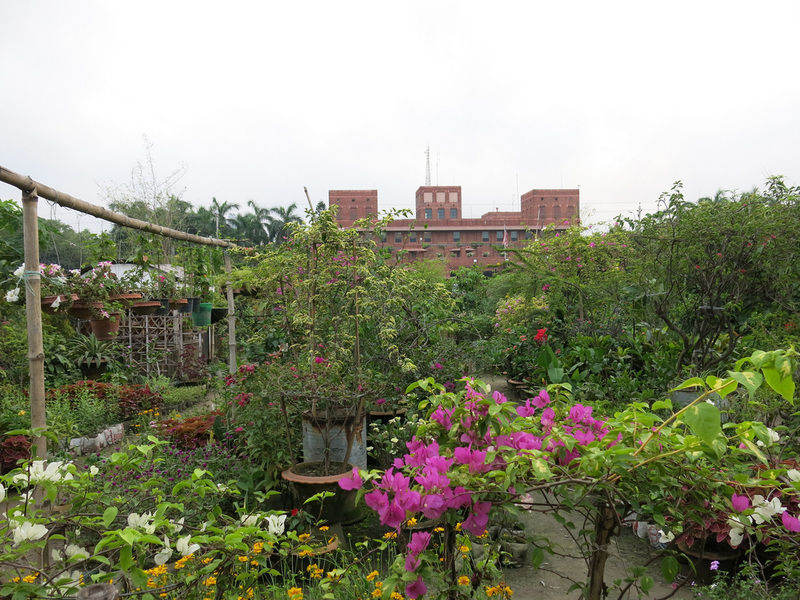 I'd prefer others to have the same Dhaka "clean slate" experience as me, so rather than share my thoughts on the city, I will only provide my itinerary. "Sites" is a relative word in Dhaka. Compared to other cities like Delhi, Yangon, Bangkok, etc. 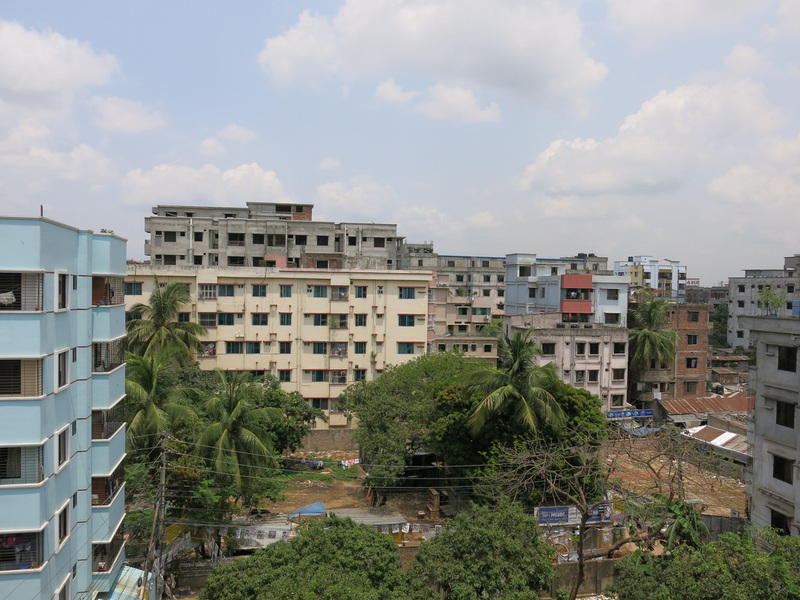 Dhaka's sites may seem a bit underwhelming. When selecting what to see I focused on a few areas of the city, searched for attractions near one another, then planned a route - the route and city scenes is the primary attraction, not the actually "sites". 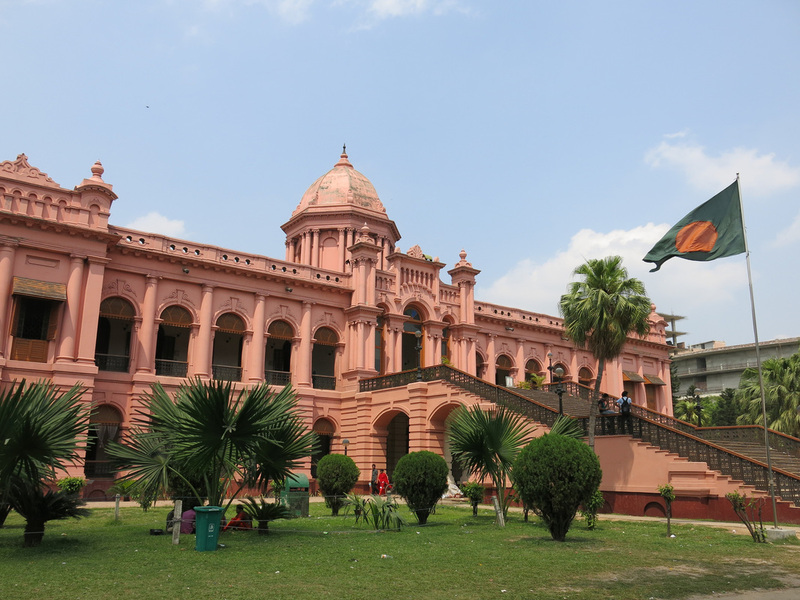 The Old City of Dhaka traces its roots back to the 1600s when the Mughal Empire established its Bengal capital along the Buriganga River. 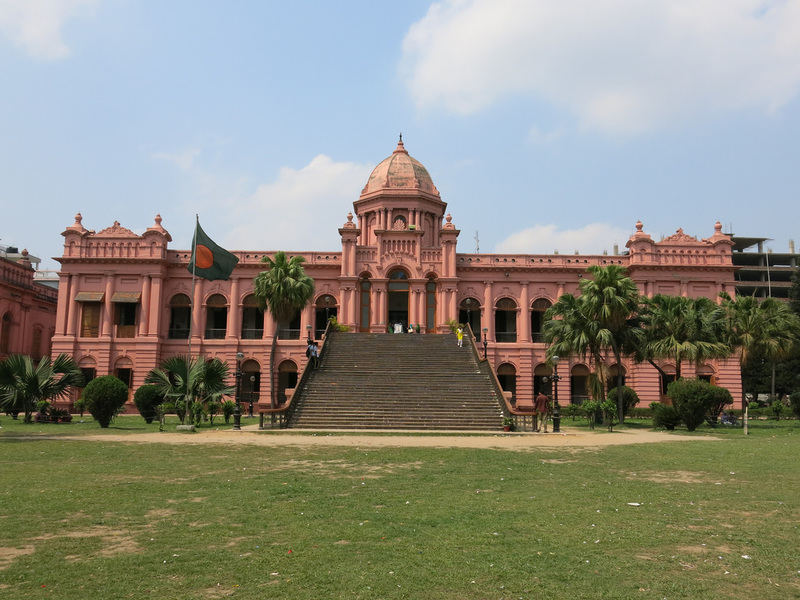 The modern and wealthier sections of the city are in the north, however, Old Dhaka in the south, remains the city's heart and soul. On a Saturday morning it takes only a forty minute auto-rickshaw ride to cover the ten mile ride from my hostel. 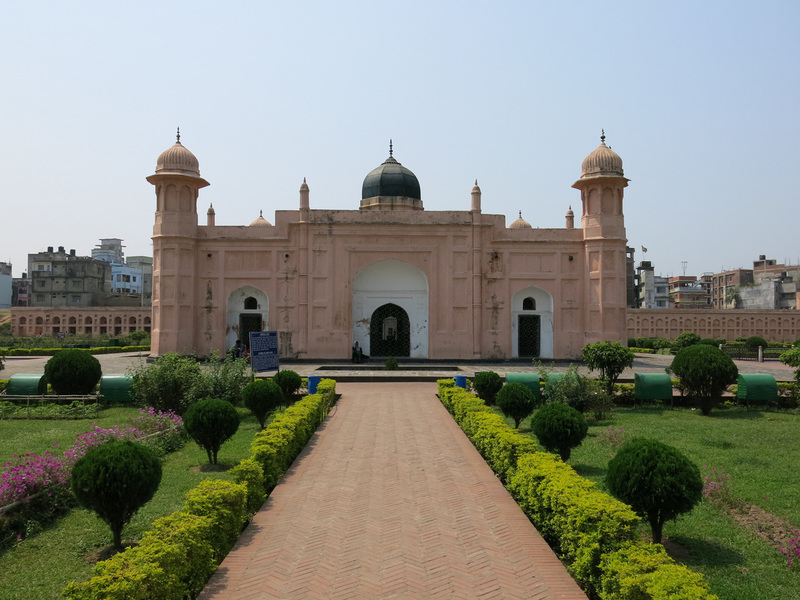 I rode the tuk tuk to three Old Dhaka sites - Dhakeshwari Temple, a Hindu site, Lalbagh Fort, an uncompleted Mughal defense complex, and Star Mosque, a Muslim site. All the sites are within walking distance although without GPS it could be a bit difficult to take the correct route. 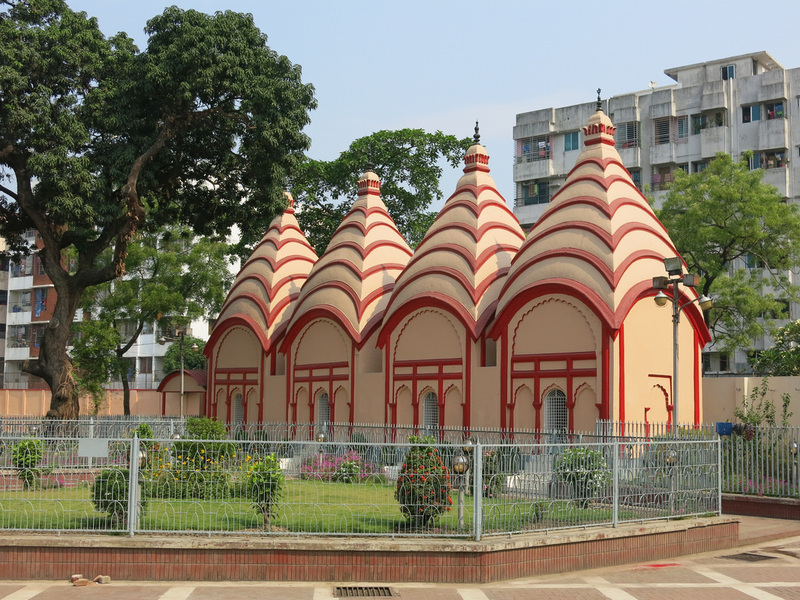 The "Goddess of Dhaka"Temple is the Holiest Hindu site in the city. The temple complex was originally constructed in the 12th Century although it has sustained damaged over the years, most recently during the Muslim mob attacks in the 1980s, and has been repaired numerous times. 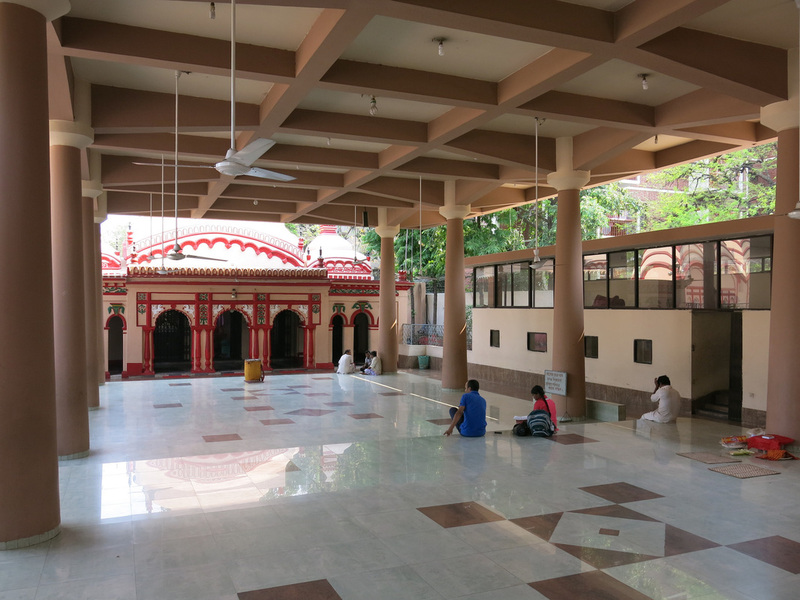 When I hear "est" anything I start to anticipate something special but this temple, with its four Shiva temples and prayer hall, was relatively simple and basic. A partially completed fort - constructed started during the 16th Century after the Mughals took control of the region. Partially completed sends the wrong impression - there's so little "fortiness" I'd say its closer to a fort that's never been started. The first building after the entrance gate is Bibi Pari's tomb. When Emperor Shaista Khan's daughter, Bibi Pari died, he interpreted the death as an omen and stopped construction. There's a small palace with a few period pieces (armor, weapons, tableware) inside. 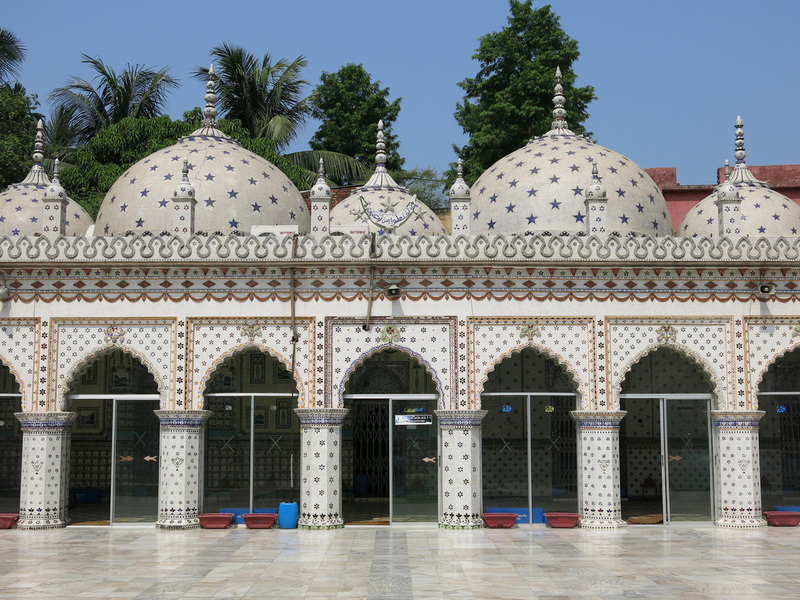 A Mughal style mosque with a distinguishing Chini Tikri tiled blue star mosaic exterior from which the mosque receives its name. An Inam unlocked the gate and let me take a closer look. 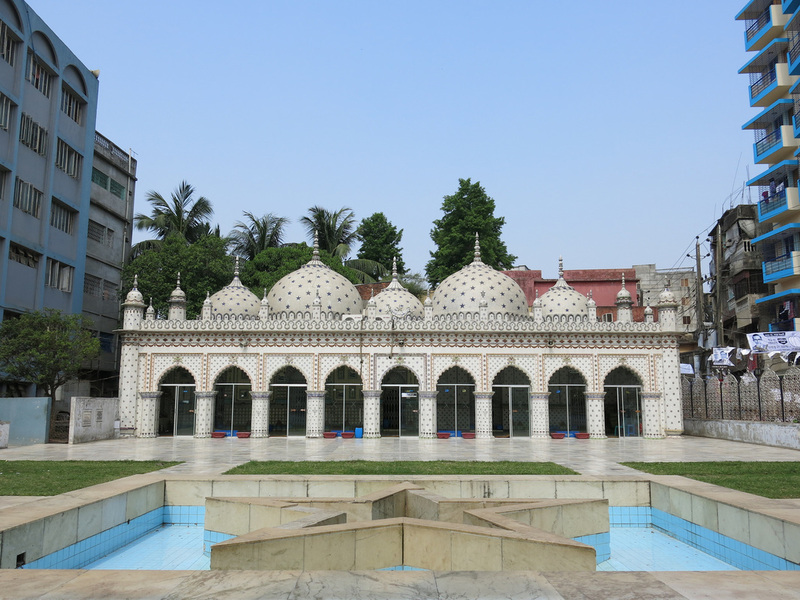 Similar to Dhakeshwari Temple, the mosque was a bit smaller than I anticipated although the blue stars inlaid in the white tile made for distinct and impressive site. The white tile radiated across the courtyard. I walked a minute back along the road frpm the Star Mosque to Nanna Biriani where I order Morog Polao, a Bangladeshi national dish and their version of Chicken Biryani. The chicken was decent but the rice stood out. 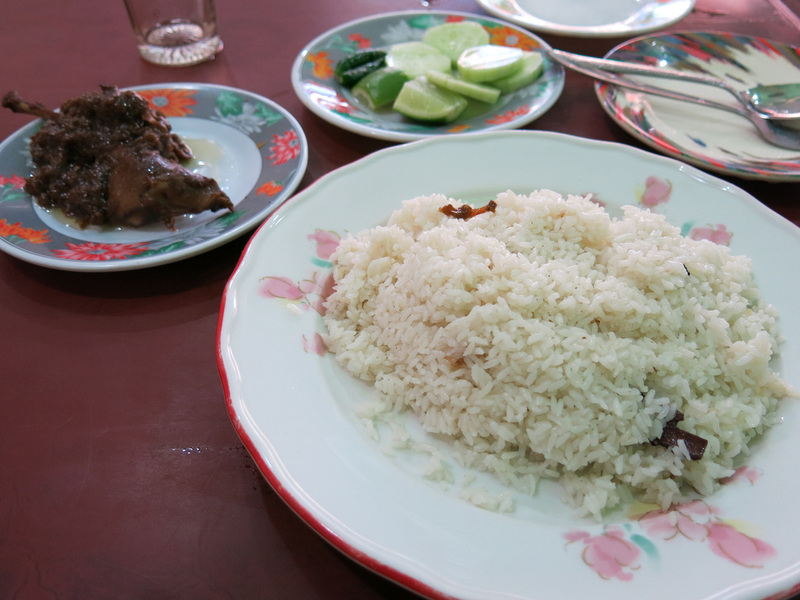 It tasted much closer to the coconut type rice served in the Malay Nasi Lemak dish. The rice was much sweeter and softer than the rice typically included with an Indian Chicken Biryani dish. I utilized the auto-rickshaw for one more ride to Shakhari Bazar. The Bazar was lined with the typical shops (spices, bracelets, musical instruments, fabric, etc. 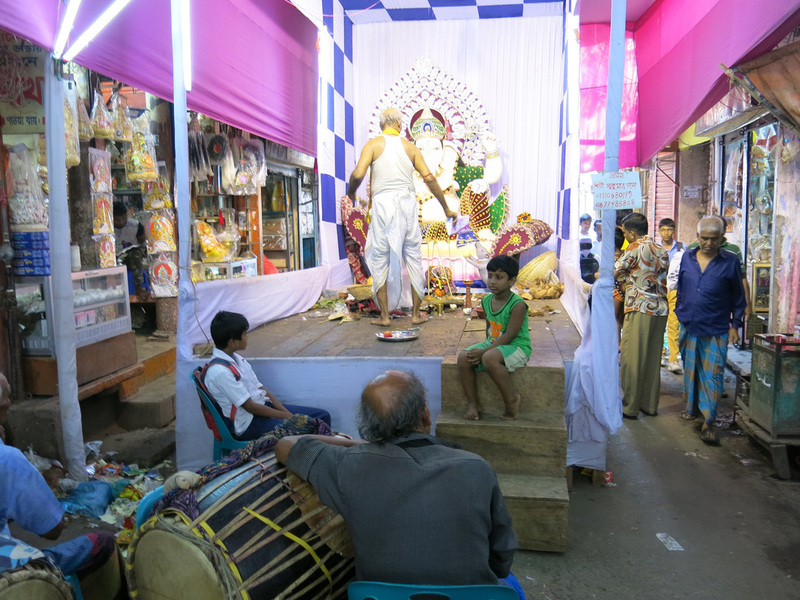 ), however, Ganesh and a few other Hindu statues were on platforms in the street. At one of the statues men played drums as another felt the music and made an offering gyration. 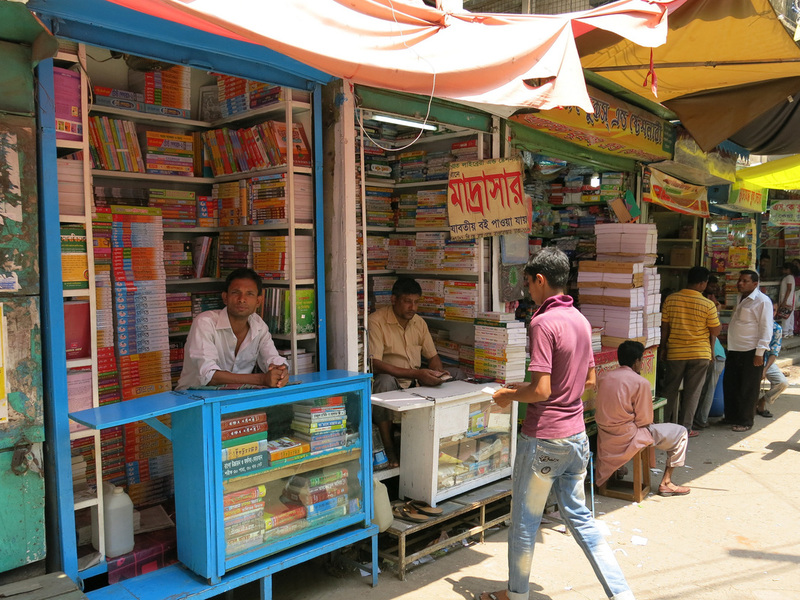 I walked down Islampur Road, another major commercial street to the Banglabazar Book Market. Book vendor stalls contained stacks of study guides. Most of the books looked old and I wondered whether the learning materials were relevant. The only place I've seen a similar book bazar was in Calcutta - it must be shared Bengal cultural thing. In the photos below, the white banners hanging across the street feature politicians. 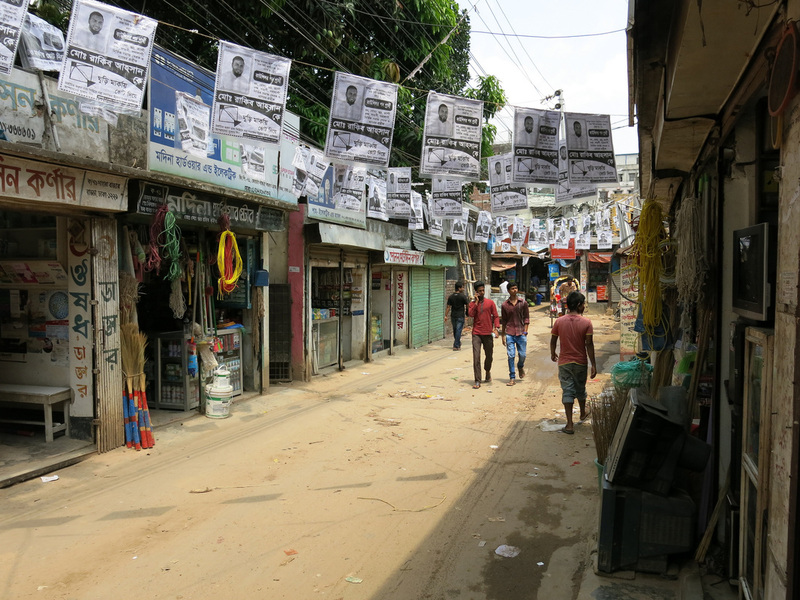 There was a nation-wide election my last day in Bangladesh. In addition to the banners, politicians "got their message out" by having cycle rickshaws blast speeches over loudspeakers. 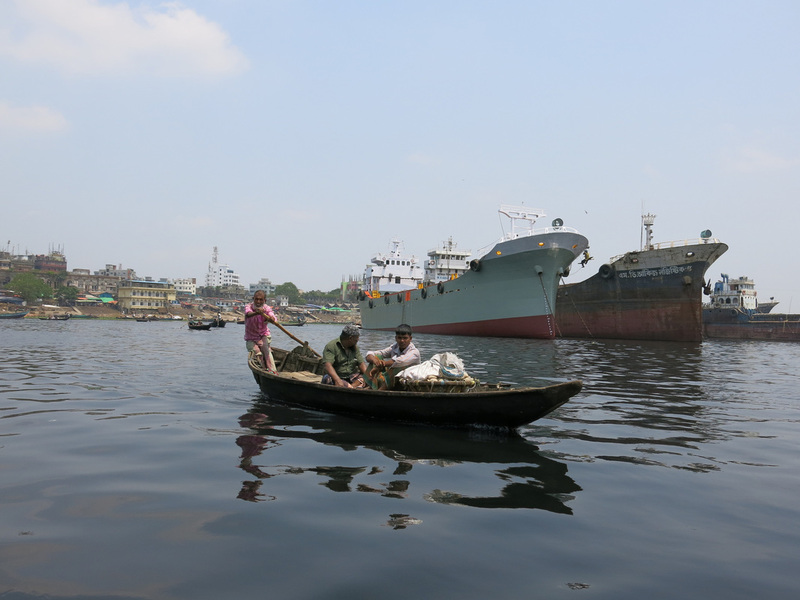 Islampur Road leads to Sadarghat Boat Terminal, Dhaka's main ferry terminal. 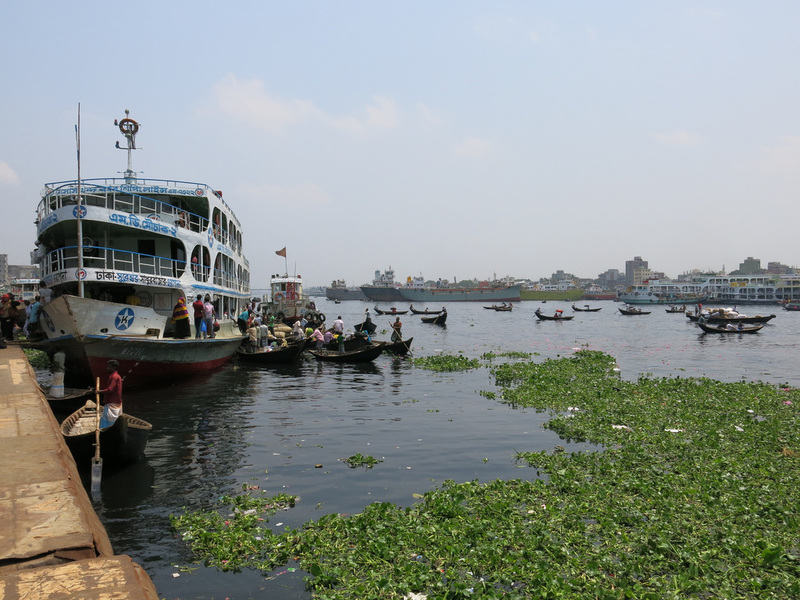 Large ferries line up next to one another offering rides up and down the Buriganga. 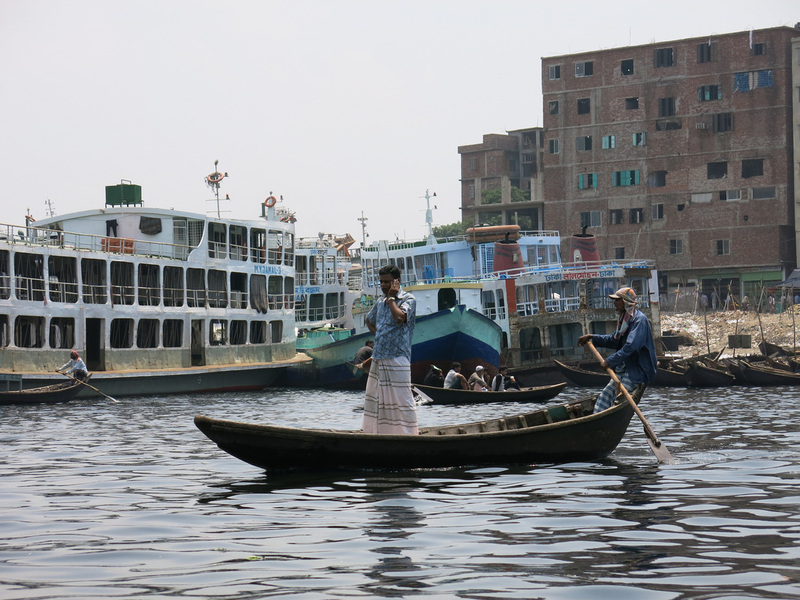 The thing for tourists to do is hitch a ride in one of the small dhows that transports citizens back and forth across the river from North Dhaka to South Dhaka. The boat is a bit wobbly. We made it to the other shore, I took a few photos, and then we returned to the terminal. The river is busy, mostly with people going from one side to the other, although I did catch a glimpse of the ship building and repair operations. All of these boats, with the single oar, does seem vaguely similar to Venice's Grand Canal. Vaguely. 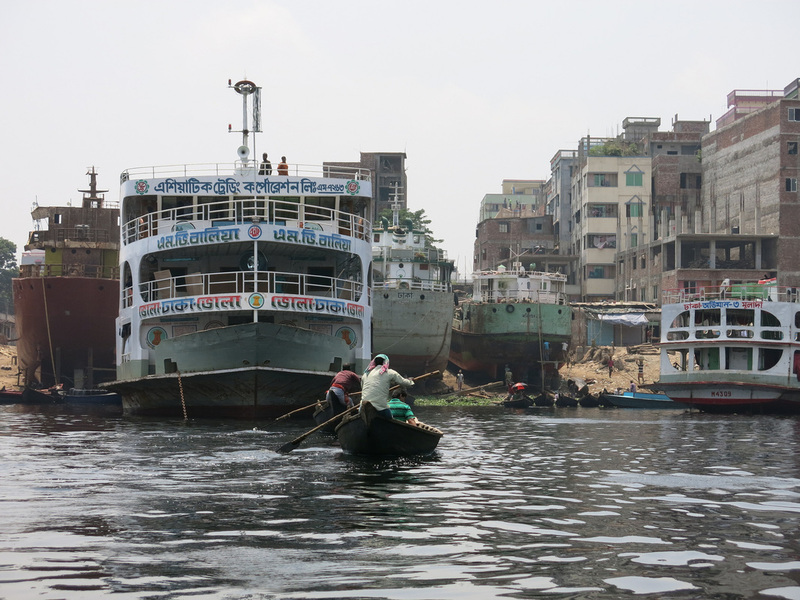 I hopped on a boat at the Sadarghat Boat Terminal (left photo above) but it would have been much better to access one at the docks up and down stream (right photo above). 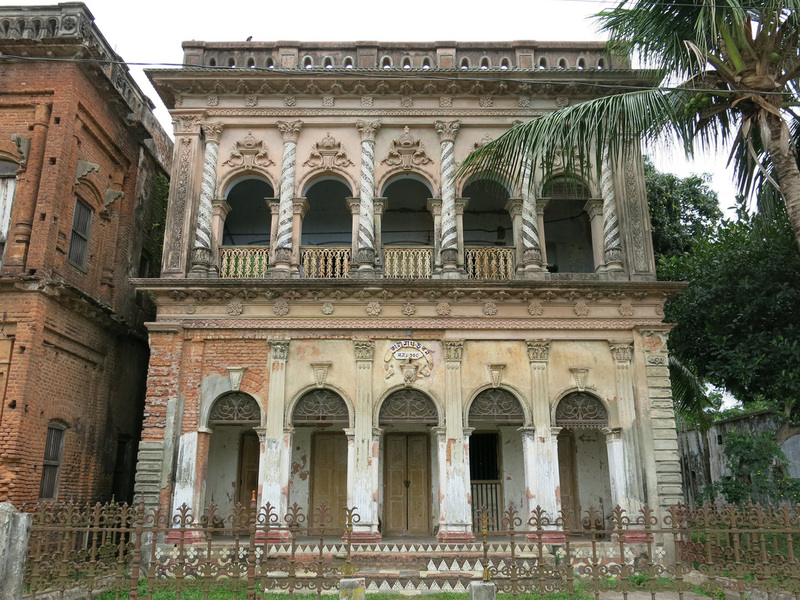 A five minute walk from the Sadarghat Boat Terminal is Ahsan Manzil, the former Dhaka Nawab Family's Royal Palace, turned slum, turned museum. Construction was completed in 1872, however, after the death of Khwaja Ahsanullah in 1901 family members quarreled and rent space to others. The government acquired the palace in 1952 and turned it into a museum. The museum occupies both floors of the palace with rooms dedicated to weaponry, portraits, history, etc. The most impressive rooms - the billiard room, the dining hall, the drawing room, and the dance hall - were those reflecting the period design when royalty last lived in the palace during the early 1900s. It was then time for another tuk tuk ride to the Motijheel Road area. 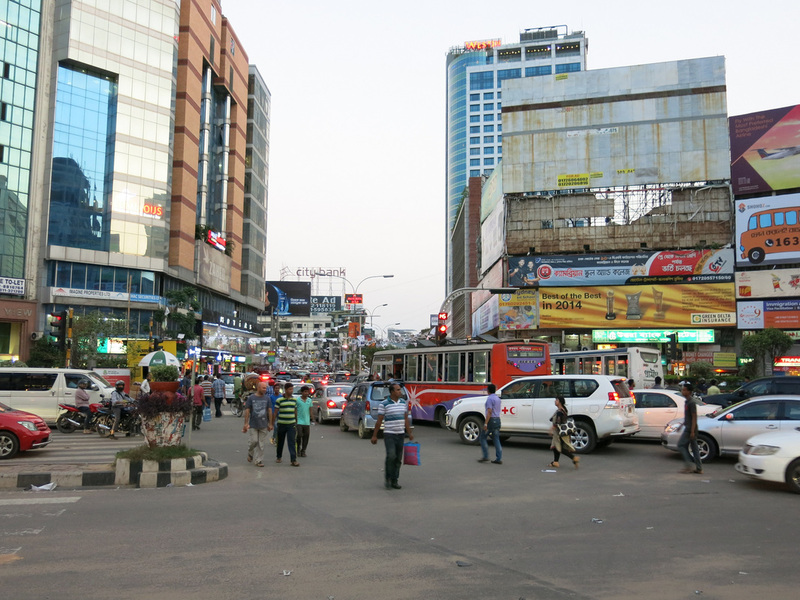 This is one of Dhaka's main business areas, at least from a domestic perspective. 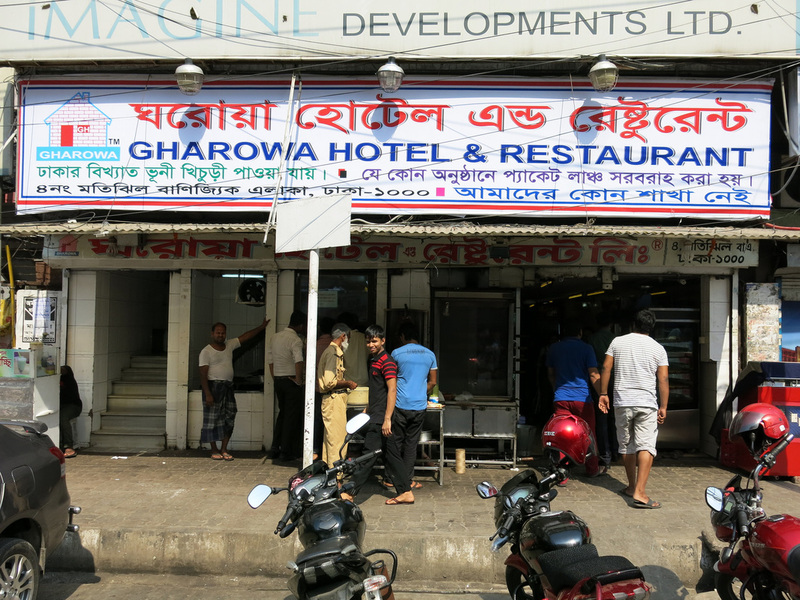 I came here for a second Bangleshi national dish, Vuna Kichuri, at Ghorowa Hotel & Restaurant. 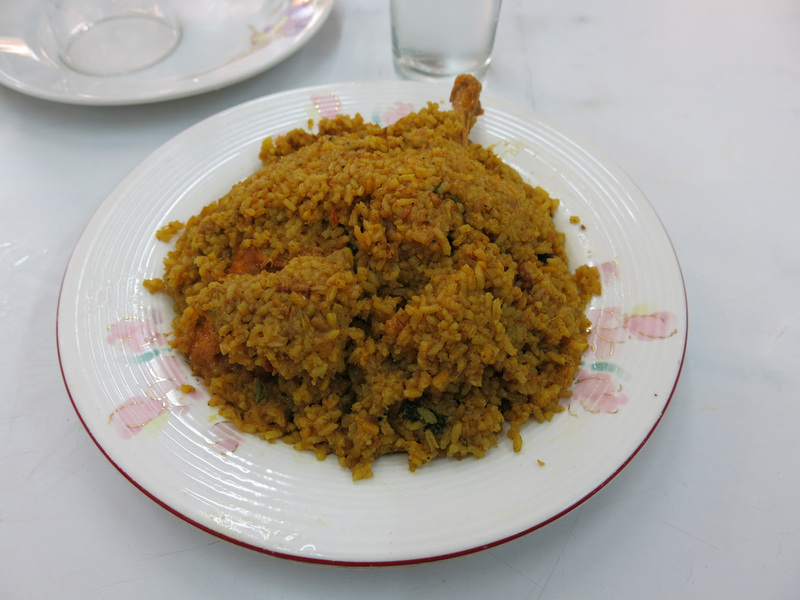 Vuna Kichuri is another chicken and rice dish - it's much, much spicier than Morog Polao. 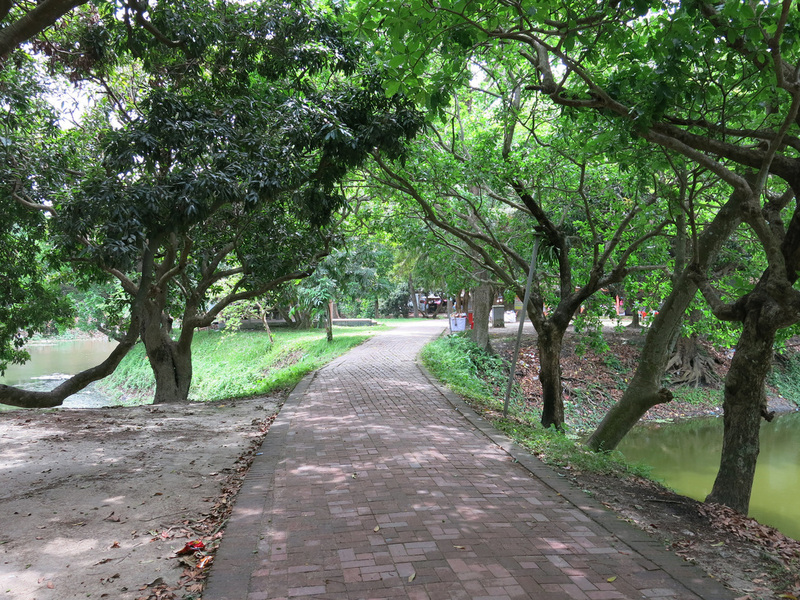 I walked around the Motijheel Area, which on a Saturday was very quiet, then hired another tuk tuk and returned to the hotel. 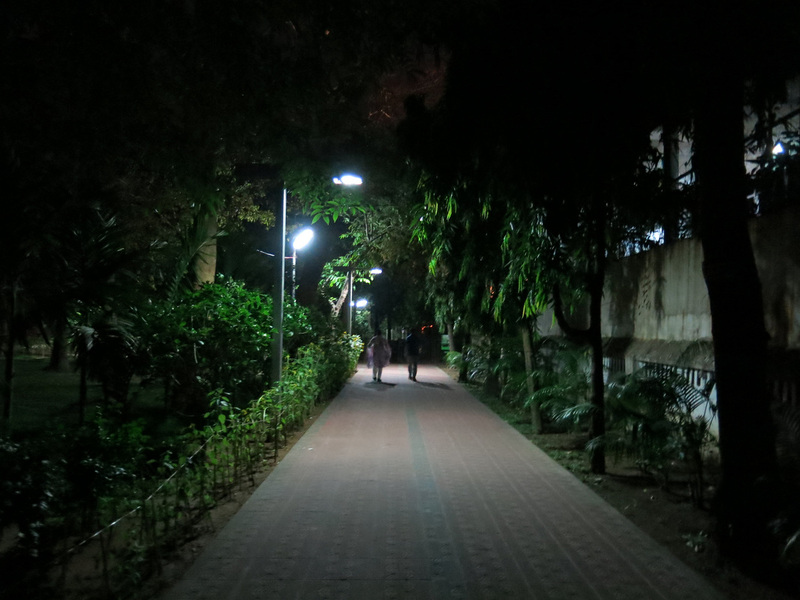 In the evening I walked down a brick pathway that runs along the western side of Gulshan Lake. From here I crossed a bridge (although I don't believe any water runs underneath) to Badda. This area is home to a few embassies, including the U.S. I walked through a nursery area then had a coffee at North End Coffee Roasters. 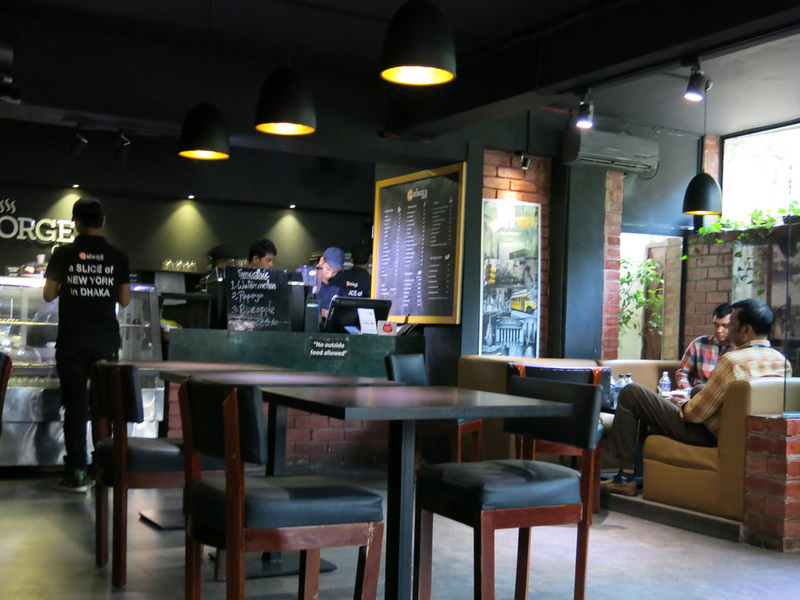 This cafe, founded by a Boston couple, supposedly serves the best coffee in Dhaka and after my first sip I have to agree. 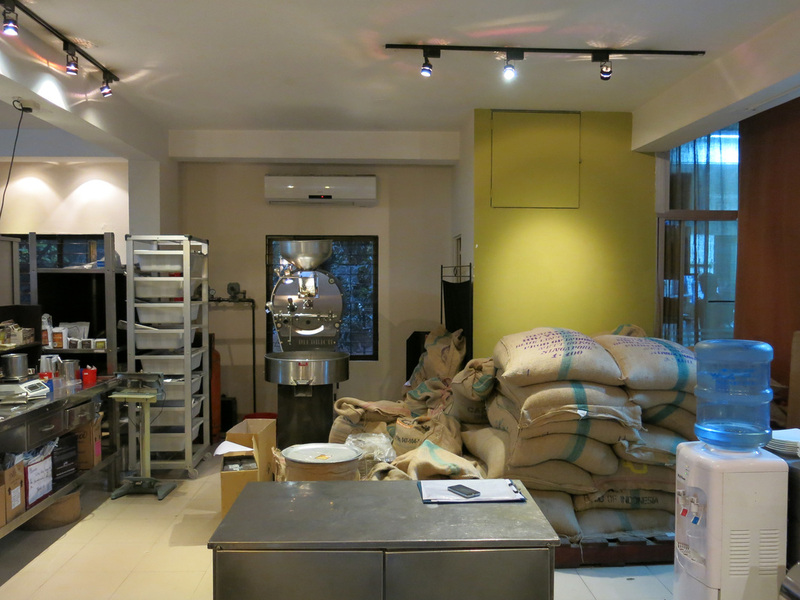 The beans are roasted on site ensuring a fresh and high quality brew. 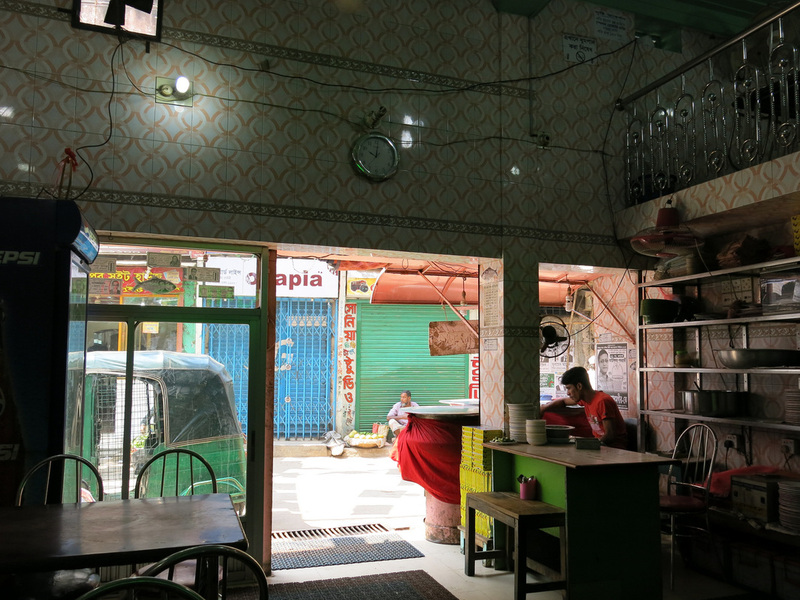 After the coffee I crossed back over into Gulshan for another local meal of beef kebabs and naan. I returned to the hotel and met one of the owners. The hotel is a quasi not for profit. The owner is involved with an orphanage and helps place young adults with jobs in the tourism industry. The guide working at the hotel was useful in writing directions and helping me get around the city. It seemed that no matter where I dined a TV set was on and tuned into a cricket match. Cricket is played during the day then watched a night. I've seen enough cricket now to understand why I don't like it - not just because it's more boring than baseball. It's because the batter may miss swing, have the ball ricochet backwards, the ball rolls over a fence, and the team scores four runs, a similar amount for a solid swing that goes forward and over the fence. The rest of the Bangladeshi TV scene is relatively easy to understand - its most Indian and American imports. Bangladesh does have a small entertainment industry, however, when it comes to producing big budget, action, song and dance films, it's tough to compete with Bollywood and Hollywood. 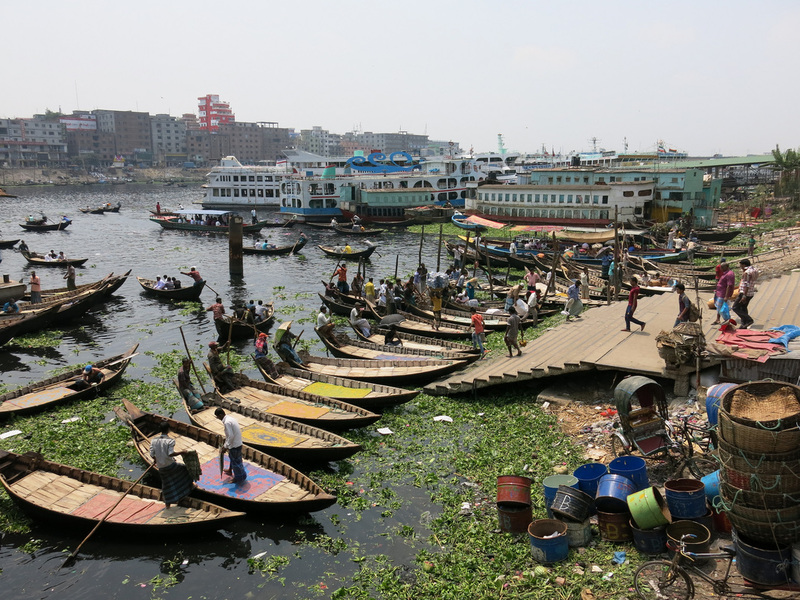 Today is split between two extremes - getting out into the countryside to see village life and then spending an afternoon walking through the upper class area of Dhaka. 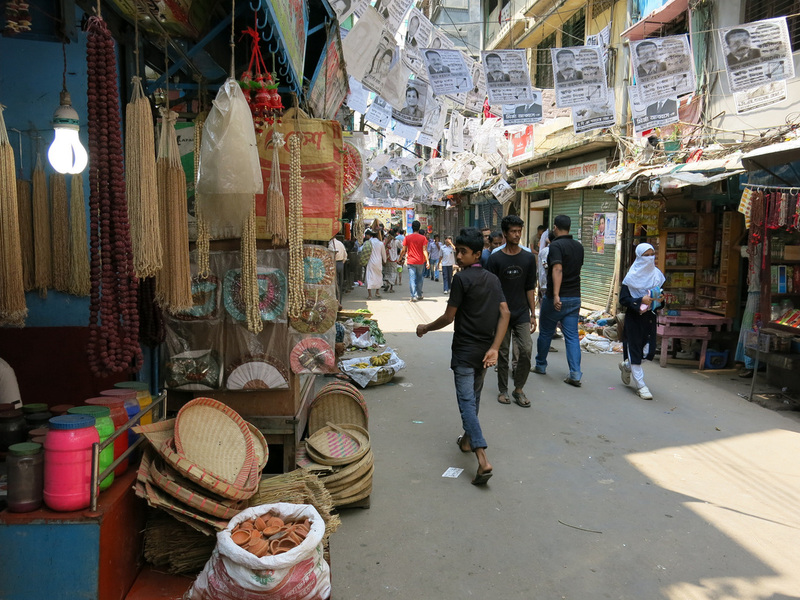 It's only proper that at some point during a visit to Dhaka one experience the city's definitive cultural aspect - crippling traffic. Traffic so slow that drivers stop using their horns. Fifteen minutes to move fifteen feet. When I boarded the bus it was so crowded I was hanging onto the door with half my body outside. Passengers started to exit and I found a seat just as the bus started to crawl. I exited the bus and started walking passed the traffic that was blocked behind a rail guard waiting for a train which showed no signs of arriving. On the other side of the tracks I jumped in a cycle rickshaw and soon the cool breeze was in my face and we reached Gulistan, a major bus station with bus services to all corners of Bangladesh. There's not really a Bus Station at Gulistan. There's about a hundred buses circling the blocks in the vicinity and without the assistance from some military police I wouldn't have found the bus to Murgapara, the village area I want to see, which leaves near the field hockey stadium. I bought a ticket and the bus left soon thereafter. This bus trip went much smoother. The 10K ride to Gulistan took two hours. The 30K ride to Murgapara took an hour. 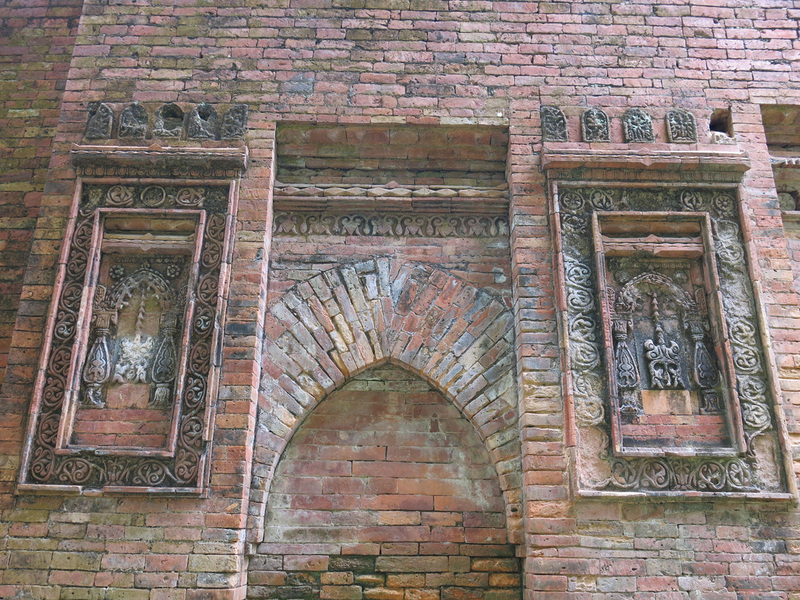 Mugrapara is home several sites, two of which are prominent: Sonargaon was a former capital (1300's) and economic center. 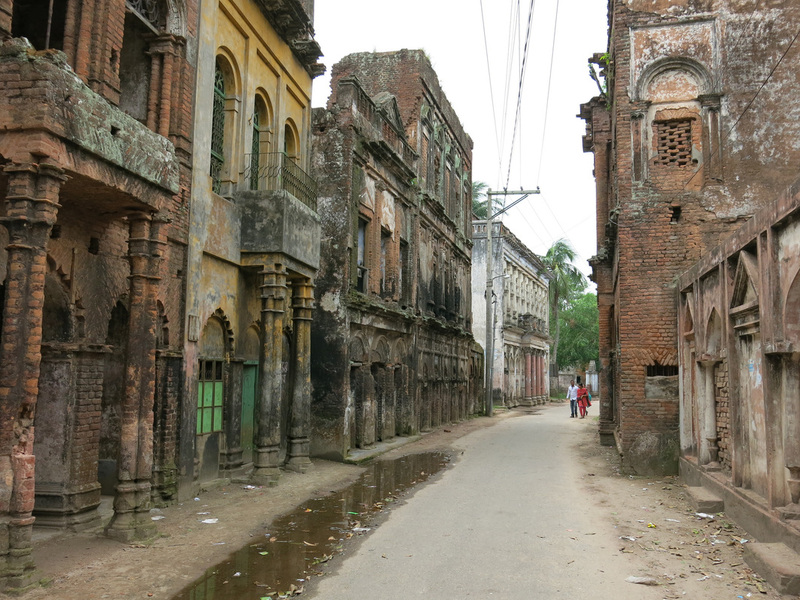 Panam City was established in the late 19th century as a trading center of cotton fabrics during British rule. I hired a cycle rickshaw at the bus station to take me to take me around the area starting with Sonargaon. 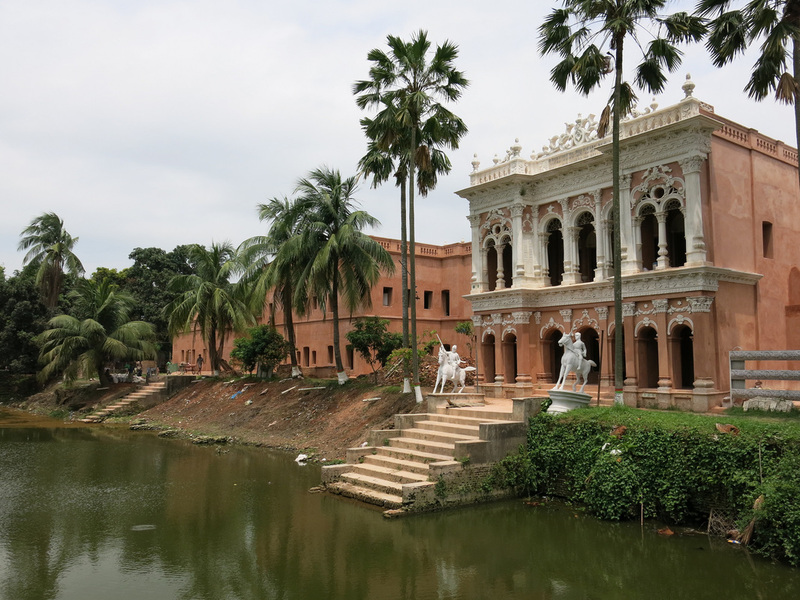 At Sonargaon two older buildings set across a water hole present an impressive opening. 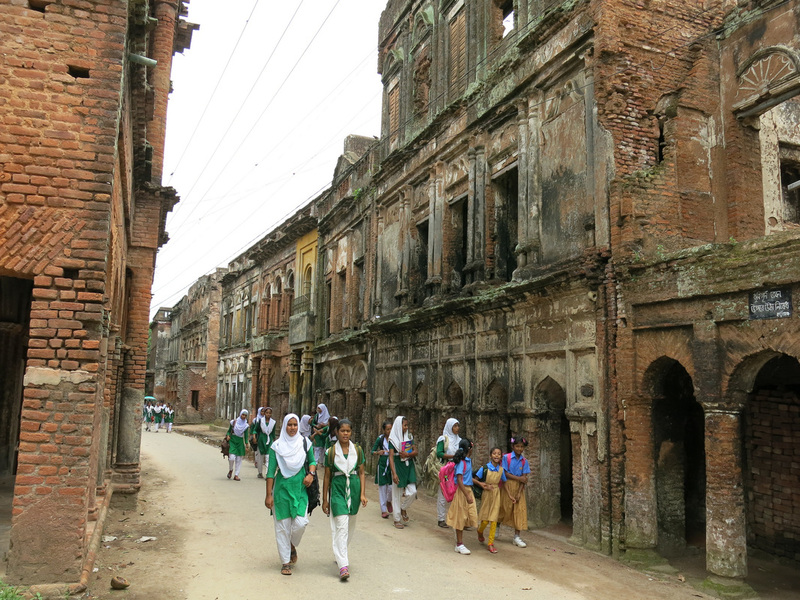 There's not much more to Sonargaon after the entrance. The site is now a large park with walking paths through trees and along ponds. 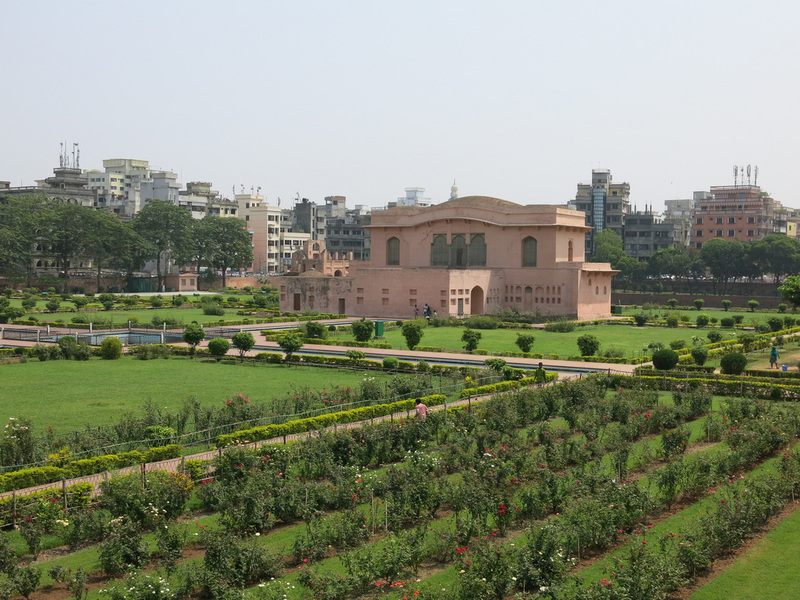 A museum is dedicated to storing and presenting the cultural artifacts from the capital era. The first floor of the museum is dedicated to sculptures and there's certainly a few interesting items such as toys. The upper floors are dedicated to the cookware and tableware items seen elsewhere. Less than a mile north of Sonargoan is Panam City. I loved this site because I felt like Indiana Jones walking the 100 yards of heritage buildings. In the first half the 1900s Panam City flourished as a trading post specializing in textiles - most of the buildings were built much earlier. During partition the Hindus, who lived in the area, were persecuted by the Muslim majority and fled to India. The buildings, which have remained uninhabited and aged beautifully. Each red brick building has distinct ornamental finishes such as colonnades or archway engravings. Just as I arrived a girls school let out for lunch. 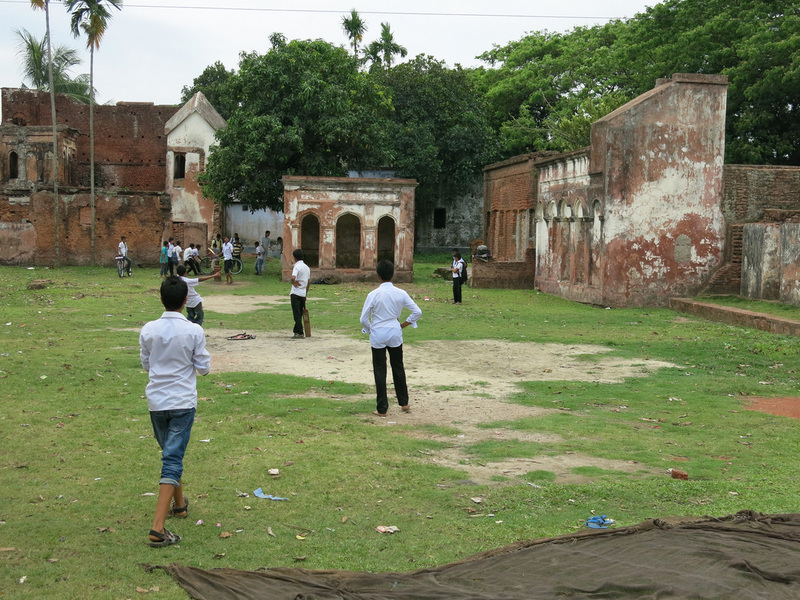 The boys seemed to busy playing cricket to attend school. 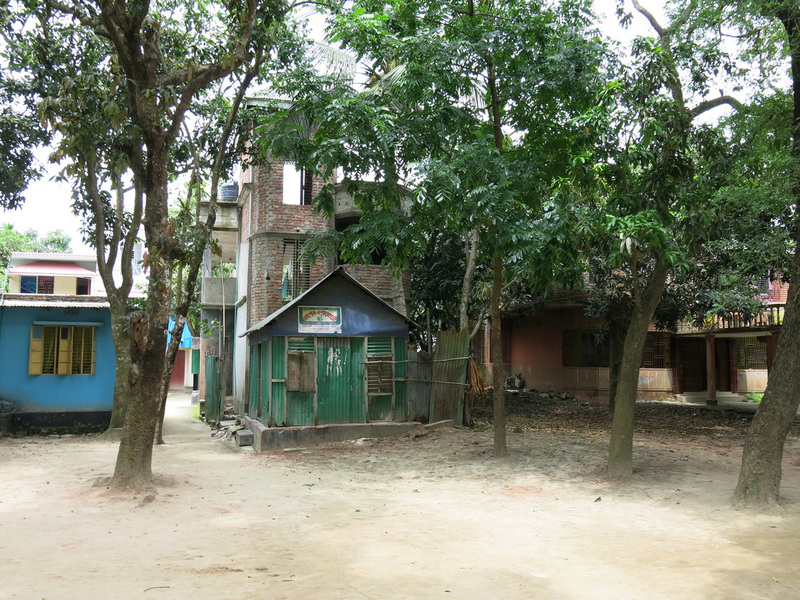 A mile west from Panam City is Goaldi Mosque. There's not much more to the mosque beyond the fact is old. 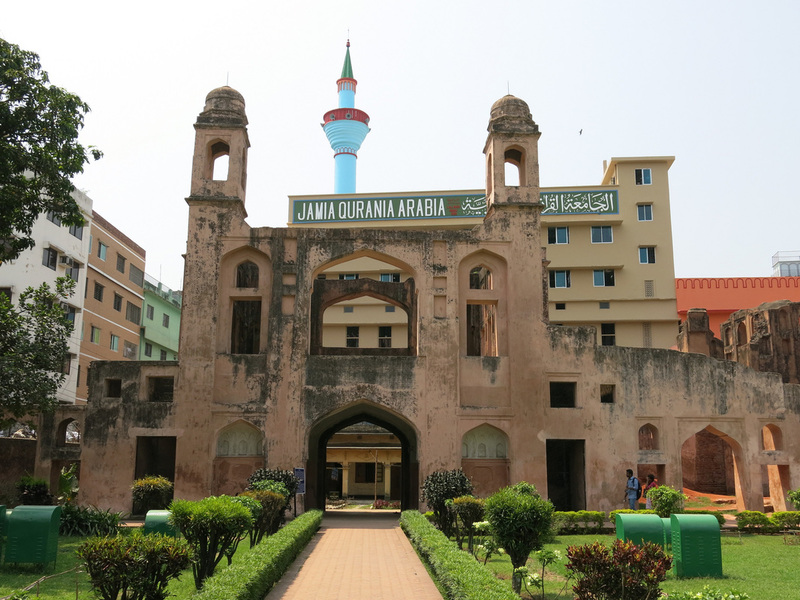 The mosque is no more than twenty feet by twenty feet with a dome on top. Out of the three sites Panam City was by far the best although from a “sites” perspective this is a long way to visit for a short period. I spent six hours in transit for an hour and a half of sightseeing. What makes this trip worthwhile is the experience. The cycle rickshaw ride between the sites was more interesting than the sites. We passed villages and homes made from concrete and corrugated steel. Shops were set along the road providing all the basic amenities for village living. 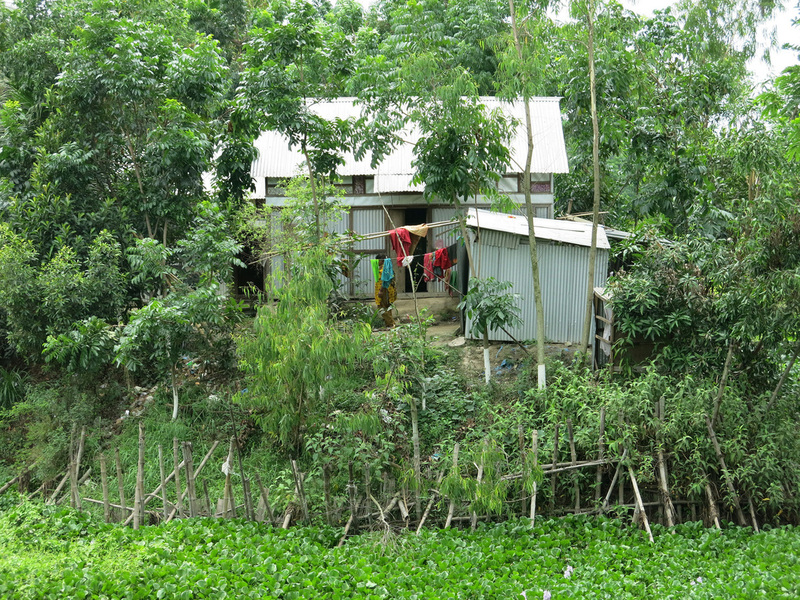 The country side of Bangladesh is very green with trees and waterways dotting the landscape. 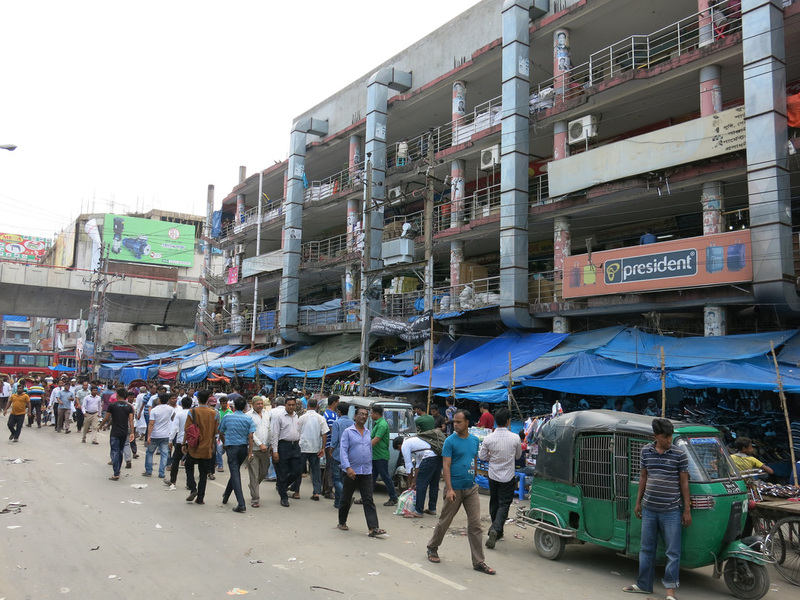 Back in Dhaka I walked around the Gulistan area and soaked in the madness. Shopkeepers offering a full range of wares, although textiles seemed most dominant, were set up in the street. Buses roared past barely missing shoppers. 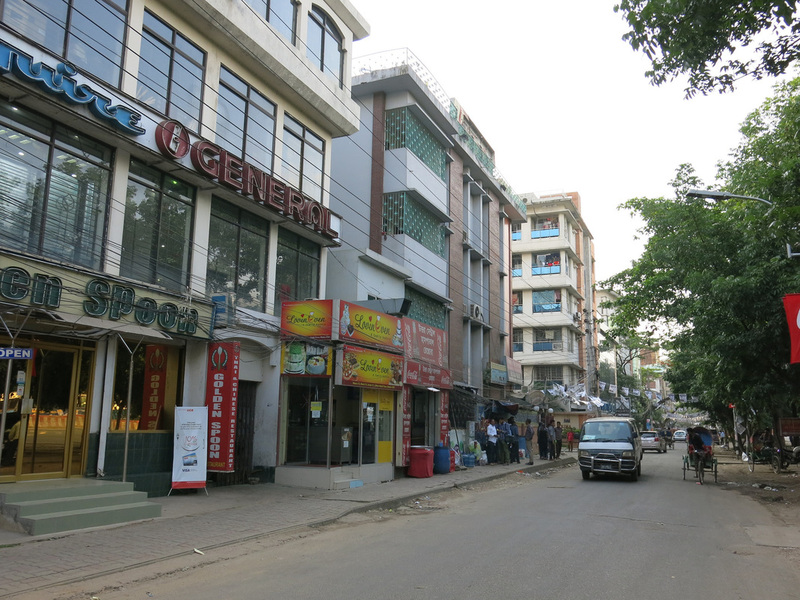 In the late afternoon I took an auto rickshaw ride to south Gulshan to begin a south to north walk through one of Dhaka's glitziest neighborhoods. I had not eaten all day so for a change of pace I went to El Toro, a Mexican restaurant. The Bangladeshi Burrito was a little flatter than the Tex Mex variety but it was still a good effort and satisfied a craving. 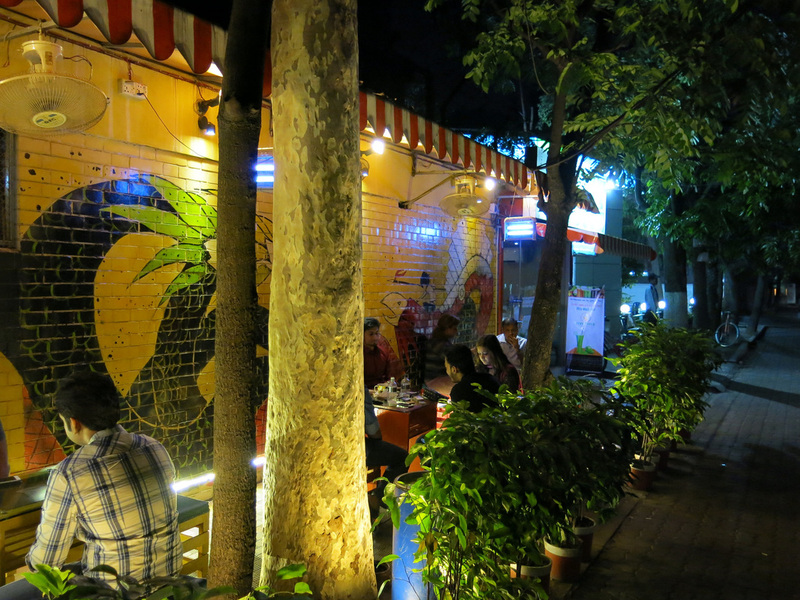 I then walked up the tree lined Gushan Avenue to Kiva Han, a coffee shop. This cafe had a good local vine where friends could hangout, business people could discuss strategic plans, and couples could enjoy a meal. From here I zig zagged through the residential area before reaching the Gulshan 2 traffic circle. 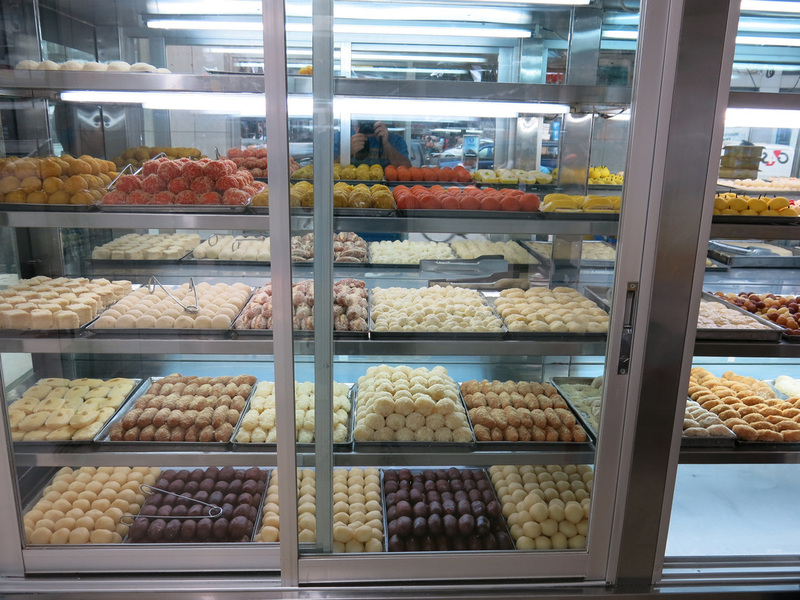 I passed a sweet shop and entered to taste some of the local dessert items. The items were a bit dry (the staff offered a glass of water without me asking) and not exactly sweet. They looked so sweet and tasty it just didn't convert when the items hit your mouth. 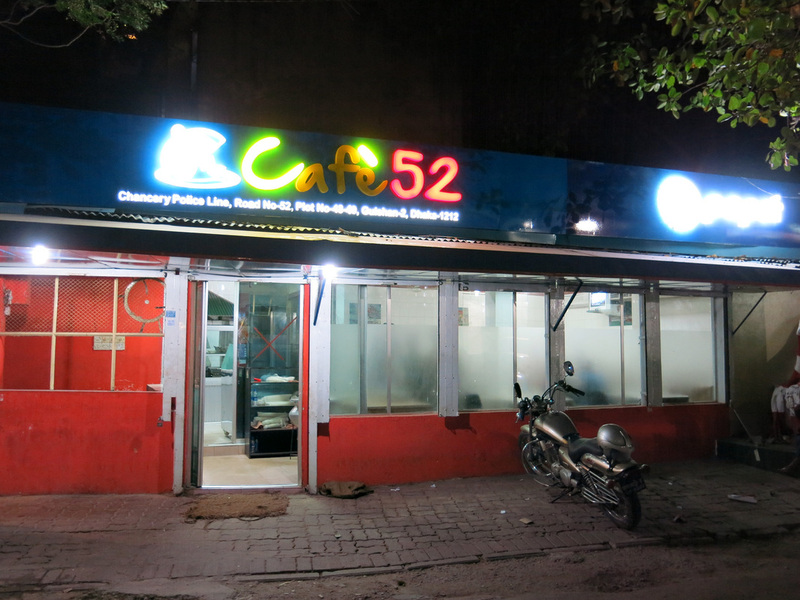 On the north side of Gulshan I found a restaurant called California Fried Chicken, a Bangladeshi take on an American icon. 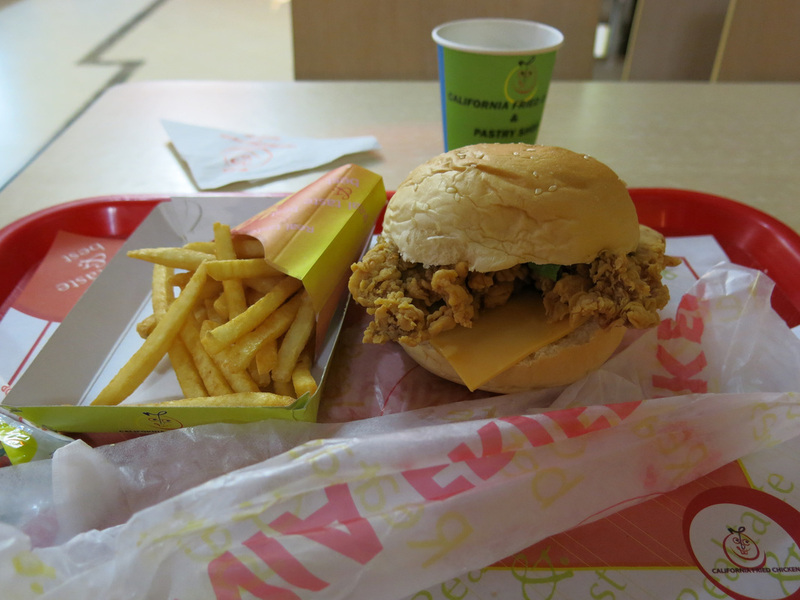 The chicken sandwich was better than the more distinguished competition but the fries could use a little help. From California Fried Chicken I made one lat stop at Just Juice. 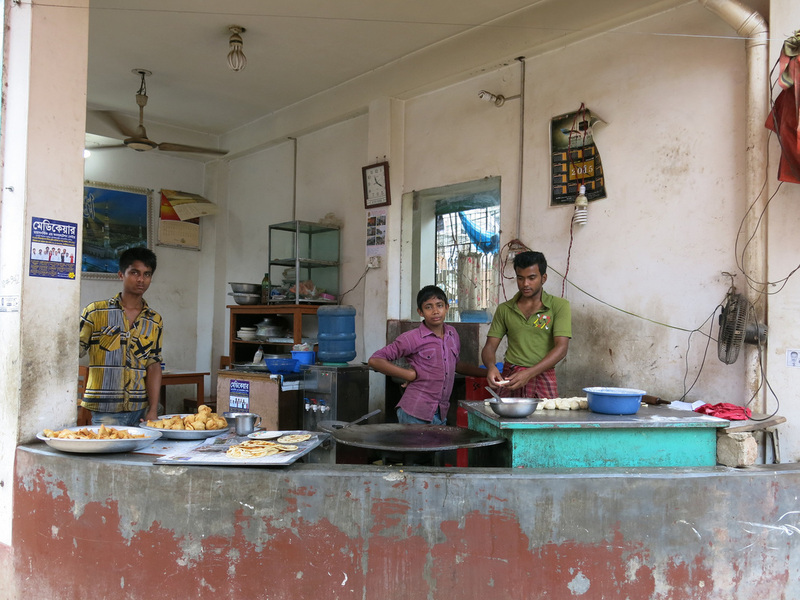 Bangladesh is a dry country and from the scene at this place I gathered people hung out at a juice bar instead of a beer bar. This place was rocking during an earlier pass so I decided to stop this time. A sign out front recommended the Green Mango shake as the perfect summer refresher. When I ordered the drink the cashier told me it was spicy. I was a bit confused not knowing how green mango could be spicy so the cashier said he'd make it a little less spicy. The first sip tasted like liquid masala - like my favorite masala flavor cheeto's turned into liquid form. And then the spice hit. The juice was still spicy, way way to spicy. This evening I read Gray Bass's The Blood Telegram, a detailed account of Pakistan's genocide of thousands to millions of Bangladeshis. Following partition in 1971, Pakistan was an unusually country with an West (present day Pakistan) and an East (present day Bangladesh). The two regions shared religion (Islam) but not much else. Despite Bangladesh have the higher population all functions of the country were performed in Pakistan. A massive typhoon struck Bangladesh's coast killing thousands and leave many more displaced. Pakistan did not provide much of a response. Shortly thereafter, Yahya Khan, Pakistan's military dictator gambled that he'd be able to win a national election - he lost as the West and East voted completely along party lines and with more people in the East, the East won. Yahya Khan responded by voiding the elections and initiated a military campaign to stamp out the Bangladeshi's democracy and independence movement. The book focuses on the interaction between East and West Pakistan, India (which absorbed millions of refugees and had a historical hatred for Pakistan), and the U.S. involvement. The Nixon / Kissinger Realpolitik was tested as the U.S. sold arms to a military controlled country (Pakistan) that stamped out a democracy movement (Bangladesh) because Pakistan embraced free market capitalism (and help facilitate communication with China) while India, a democracy, had communist leanings and ties to Russia. The final morning I walked through the neighborhood. On the west side is a residential section that is nice for anywhere. 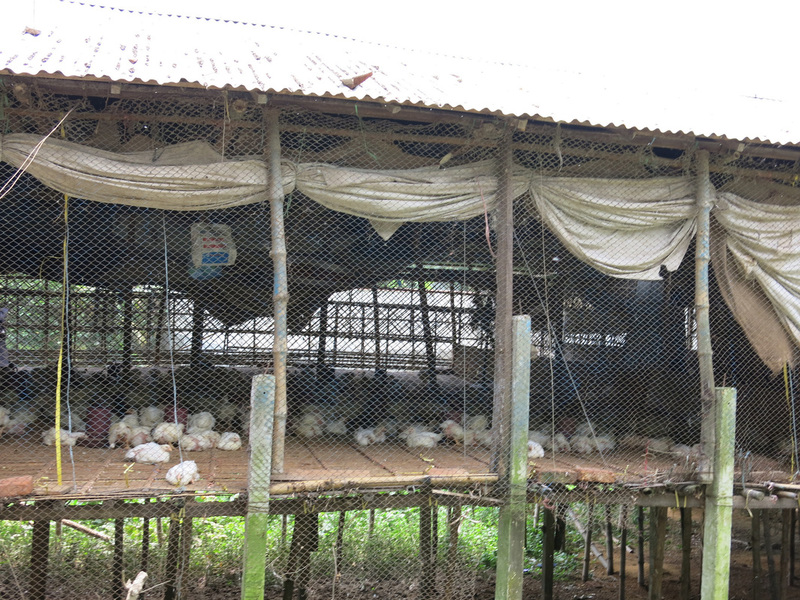 Usually in developing countries the areas are only relatively nice…i.e. 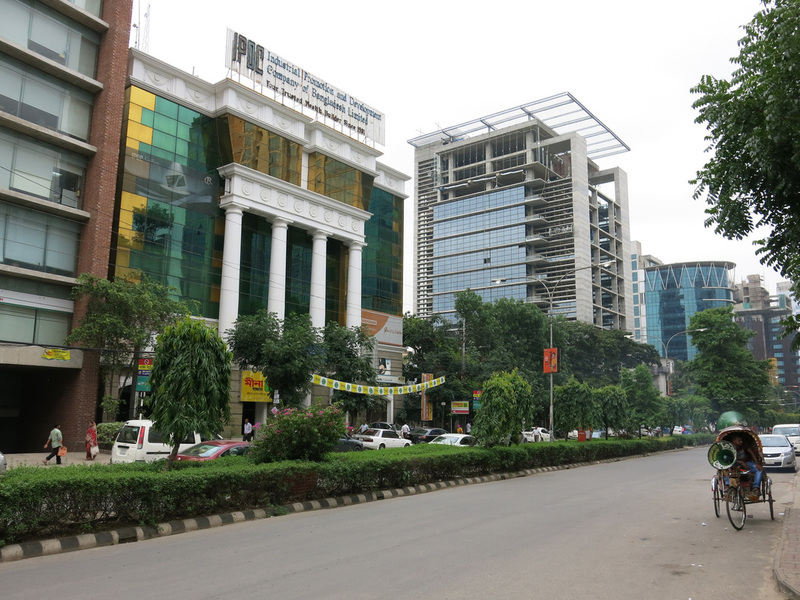 upscale areas in Delhi are nice for Delhi. This residential area, called DOHS Baridhari would be nice in any country. 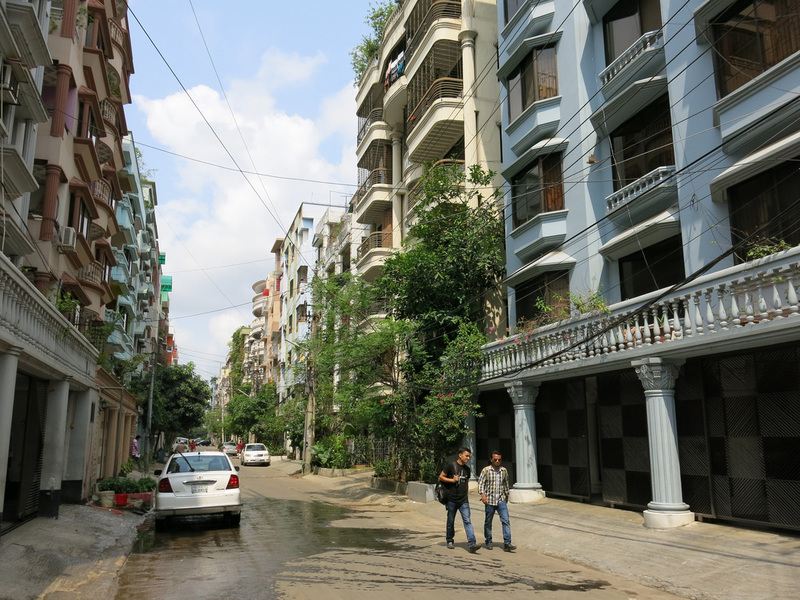 High rise apartment complexes stretched along wide boulevards and the infrastructure seemed complete - there was no “in process” gap between where the private residence ended and the public street began like I found in New Delhi. The area immediately around my hotel offered a safe environment to walk and see how the “other half” lives. Barbers, butchers, cell phones providers, TV repair, and convenience stores offered everything to make the area a self contained community. I ordered a sample of roti and samosas from a food stall that always looked like they were cooking up something good. My eyes did not deceive my taste buds. The roti was hot, soft, and fresh and the other items were also good. 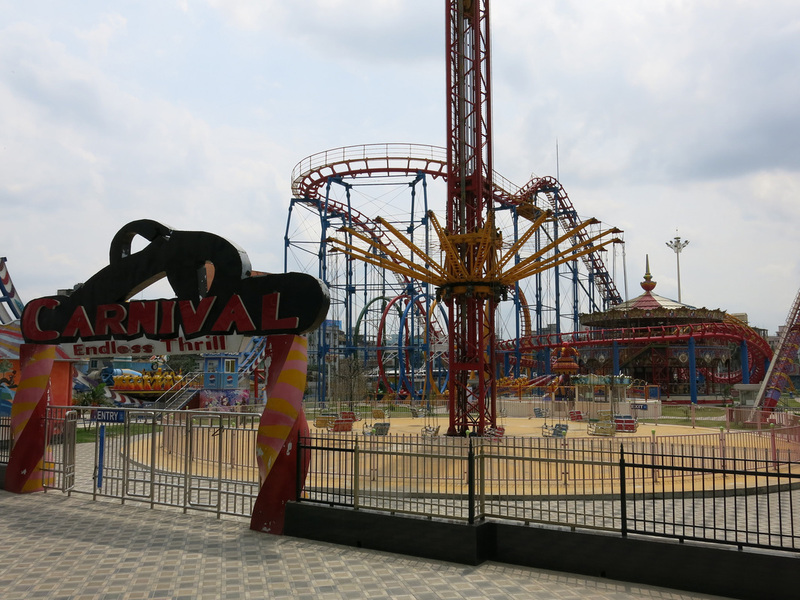 Midday I went to check out Jamuna Future Park, a massive shopping complex less than a fifteen minute walk away. The mall took a page from Field of Dreams “if you build it they will come” concept. 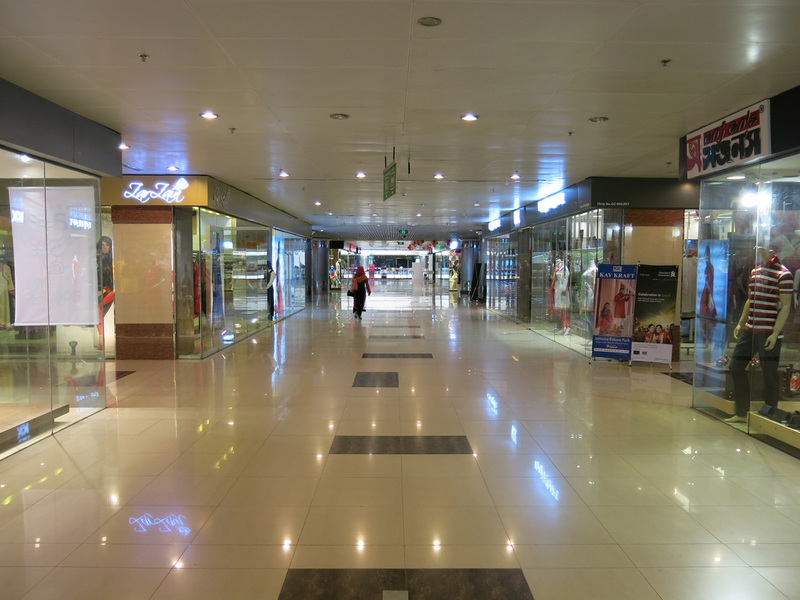 The mall was flashy yet it seemed that many storefronts were available for rent and shoppers were few. It was a Monday afternoon but the place still felt a bit like a ghost town. The food court was quiet. It was a massive five story, five “court” complex and even on a busy day I think the place would still feel relatively empty. 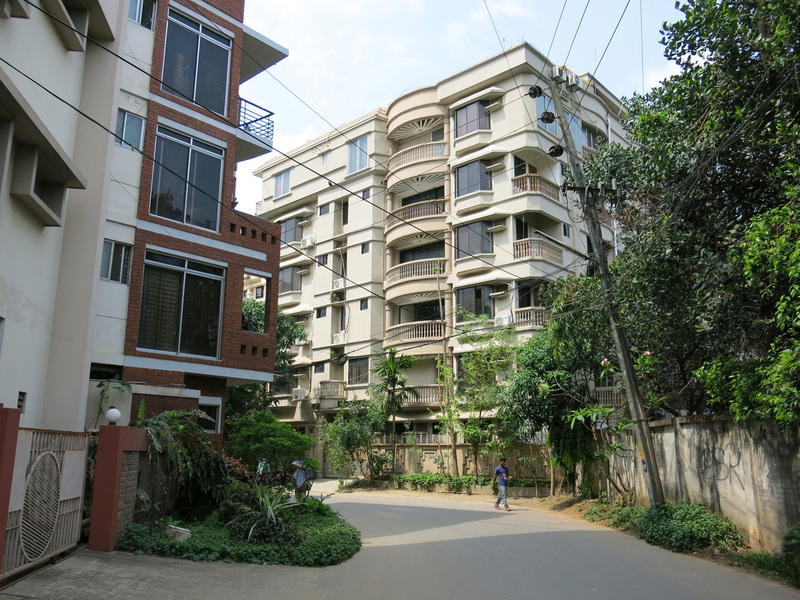 Before heading to the airport I made two more coffee stops in Uttara, another nice residential area north of the airport. 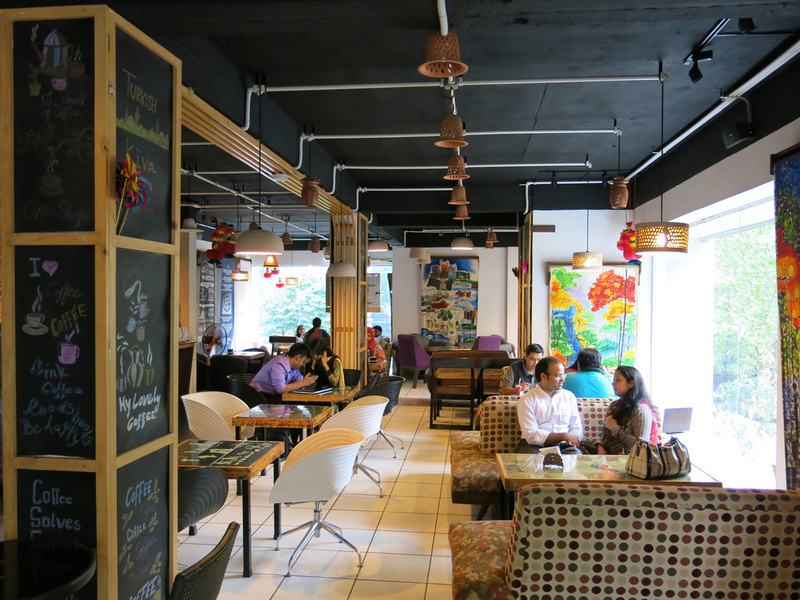 The first stop was Coffee Glory International, a nice place with kind of weak coffee. The second stop was George's cafe, a nicer place and stronger coffee. VISA ON ARRIVAL - A visa is required for entry. Fortunately this may be obtained on arrival. The cost is $50 +$1 for tax. The payment must be in USD (I believe a currency exchange is available, although it's much better off arriving with the correct amounts). To avoid frustration people in line behind you be sure to bring HARD COPIES of your hotel and return flight information. TUK TUKS FARES AND DIRECTIONS - Like everywhere else the tuk tuks will overcharge. What's annoying in Dhaka is they agree to one rate, get lost, then complain until you pay a little more at the destination. I always had a hard copy print out from Google Maps to show where I was going. This was useful because on every ride the driver never knew where I wanted to go. Passersby on the street were incredible friendly and helpful in provide directions to the driver. DIRT - Bangladesh is clean, however, there's dirt everywhere. It blows in your eyes. It gets in your mouth. After three days I had a cough and dry mouth. 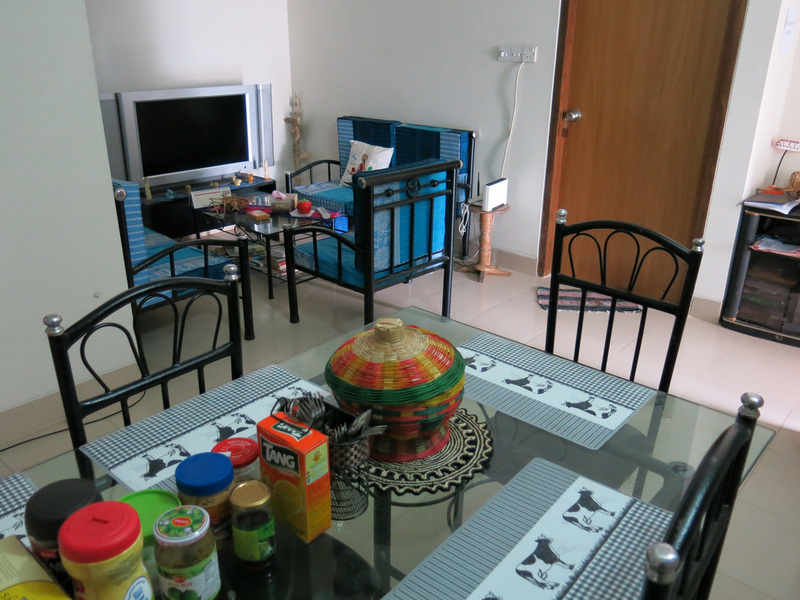 Still though it's a clean place - much, much more so than neighboring India. 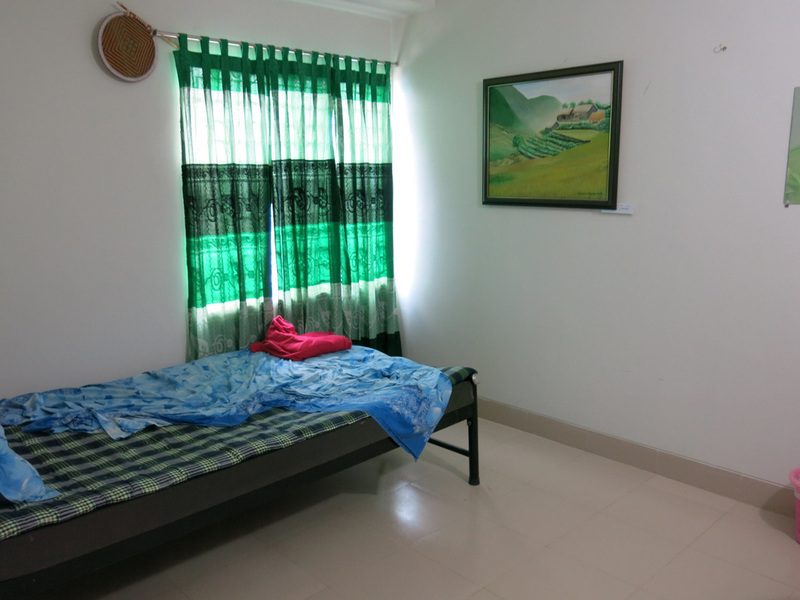 ACCOMMODATIONS - I stayed at Golpati Bed & Breakfast. 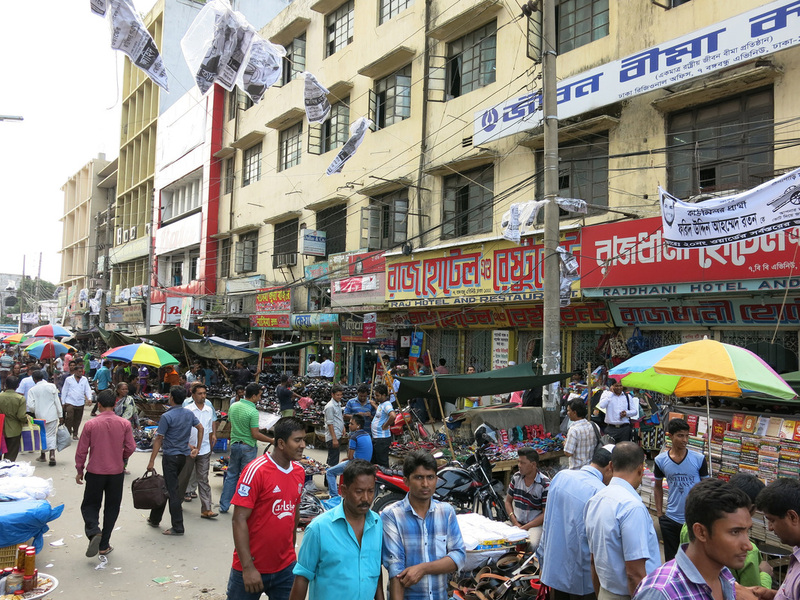 It was located in a residential bazar, however, it was a bit far from Old Dhaka although only a thirty minute walk from Gulshan. Very strong WiFi connection, Satellite TV, and functioning shower - can't beat those amenities. Photos below of hotel and hotel view.